Today, I'm sharing two cards I created with the following products from the February Release: With Much Thanks stamp set, Thank You Die, Easter Eggs Dies, Easter Card Collection 2016 and Pastel Paper Pack 2016, along with previously released ODBD Custom Dies. (See supply list below). The struggle was real....It took everything I had to not break out ink and sponge dauber, or Black card stock! If you are a frequent visitor to my blog you know that my signature style is black layers. Both of my cards are CAL (clean and layered) with a lot of dies thrown in for added interest and detail. I love the flourish script on the new Thank You word die, here I paired it up with beautiful papers from the Easter Card Collection 2016 and Pastel Paper Pack. Using the Double Stitched Rectangles and Rectangles die sets I was able to layer the papers for a lovely background. The tiny flowers that embellish my card are from the Easter Eggs die set. 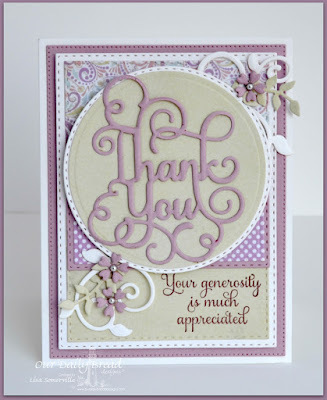 My next card also uses a sentiment from the With Much Thanks set along with the new paper collections. For added interest and detail, I stamped images from the Flourish Label Borders set onto the die cuts from the Vintage Flourish Pattern die set in Plum ink. Three randomly selected winners will each receive a $25 gift certificate to Our Daily Bread Designs, good towards the purchase of ODBD stamps found in the "ODBD stamps column" of the ODBD Website, just for commenting on the Design Team cards! You have until February 2, 2016 at 9:00 p.m. EST to leave your comments. The Winners will be posted February 3rd, on Our Daily Bread Designs Blog, so be sure to check back there to see if you won! Both of your creations are so beautiful, Lisa!! I love the delicate designs with all the layering of dies as well as the soft pastels!! Gorgeous cards!! Lisa - two beautiful Thank you card - I love those dies and the color choices - nice job! WOW Lisa, simply beautiful! I am loving these colours, they really are Easter colours and you have showcased them well! I love the papers you used and the stamp detail on the second card! The border on the second one as well is really pretty with the other die cuts and those beautiful papers! I like the flourishes and flowers on the first one to go with the flourishes on the thank you, really pretty! Two stunning thank you cards. Lovely cards with beautiful details! 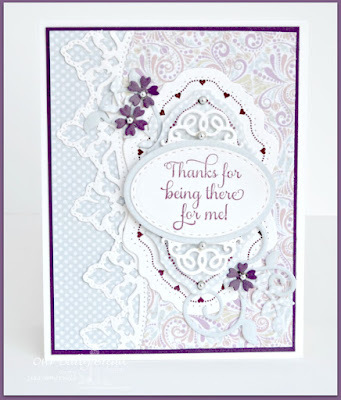 Like the colors, the lace look of the border die & much more. Have a BEE-utiful day! Both are beautiful and gorgeous! Beautiful thank you cards. I love this new release. Wonderful cards with beautiful layers. Love the colors of both cards Lisa! Lovely layering, clean and well designed! So very pretty! Love your colors and details and use of dies. Your cards are so beautiful Lisa!!! Love how the white just pops on that first card! Very pretty cards! The more I see the thank you die, the more I am loving it! These are beautiful - what lovely choices of dies, colors and patterns. Lisa, I love both of your thank you cards! The soft pastel color palette is gorgeous as well as your combination of stamps and dies- thanks for sharing! What beautiful TY cards, Lisa!! Love how you used the borders and paper combo! Awesome cards!! I applaud your self-control with not sponging anything!! Were you sweating bullets? LOL!! Both cards are BEAUTOFUL and we will have to do the Thank You card in our die class!